The numbers of moose and their survival is depending on us humans - as hunters or nature preservers - moose cannot survive without our good-will. Today the moose has it largest geographical extension and quantity ever due to wildlife conservation and national parks. Additional positive aspects and advantages for moose are more forest-fires, more deforestation and field resting of agricultural areas leading to perfect food supply - young forest. The main threat is the human. Native people in North America relied on the moose meat for hundreds of years. They worshipped moose for giving their lives for their survival. The Cree for example put moose antlers in trees in order to satisfy the moose's spirit by seeing the sunrise, not being upset for being killed. North American, Swedish and Norwegian hunters were known to value the moose with rock carvings. The ancient hunters used nearly all parts of the moose: bones and antlers for tools, the skin for clothes and tents and hair for decoration. Early hunters (4000 B.C.) already used a noose to catch moose without antlers (which was easier to snare) and stabbing with spears them when they had been trapped. In winter they drove moose to areas with deep snow covered by a thin ice layer. The hunters wore snowshoes allowing them to stand on top of the ice layer, while the moose sank down. Trapped like this they were easy to kill. In both Eurasia and America the moose was nearly extinct because of extensive hunting. The protection in the late 1800s in North America initiated by naturalists brought the recovery of moose population - hunting seasons and contingents substitued the excessive killing. In Sweden around 100.000 moose are shot every year in a luckily rather short hunting season, which is furthermore regulated to save the species. The total population in Sweden is around 300.000 animals. So over 30% are hunted every year. A problem of course was and is, that also the natural enemies of the moose were more or less extinct - bears and wolves. The mass-increase of moose, e.g. in Sweden, was also caused by extensive forestry, i.e. deforestation. The young shots as an outcome of this, were optimum food for moose and powered their reproduction (on the other side not really helped the forest to come up again ...). 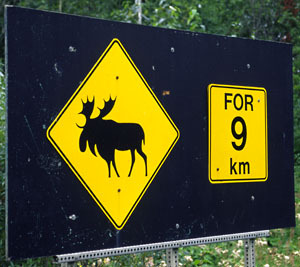 Also leathal (and often not only for the moose) is usually the contact with cars - moose are reason for many hundreds of accidents in several moose countries (e.g. Sweden noted over 3000 a year). Moose tend to be quite stubborn in leaving such streets and flat ground when once found. Fences, tunnels and mirrors are tries in Sweden to decrease such accidents, but it's expensive and could not stop the risk for both sides yet. Several tries have been performed to domesticate moose just like deer, sheep or cow. Leadership has been taken from Russia in both pacifistic and military applications. Moose can supply milk and meat. If you take youngborn calves away from the mother, the cows give up to 400kg of milk and - they are punctual for milking ! Moose are quite loxal to their humans. Moose were used as beast of burden in North Europe and Asia. In Russia they have successfully pulled heavy sleighs of 400kg with 3-4 km/h a whole day, giving an action radius of 20km - in hardest terrain! They can also carry up to 125kg on their back. They were trained and used as mounts for riding in Sibiria and Sweden - especially for military purposes. The "secret weapon" was the enormous fear and panic of horses when encountering moose - military tried by riding moose to utilize that fear to in roder disturb the opponents. In Europa this fear of horses finally made it impossible to use moose for pieceful applications besides horses. Also problematic was the seasonal dependancy: Moose are - following their usual yearly course of action - weak in later winter/early spring and summer and not able to perform heavy work..
Moose are actually hard to keep in captivity, mainly due to their special requirements on feeding: They cannot be fed completely with durable food such at other domesticated species, they still need fresh food, e.g. vast amounts of leaves. It is possible to additionally give some oat mash, beets and potatoes, but not exclusively. Also livestock diseases hit moose more than other species, they are in fact quite sensitive against other deer's diseases. Besides special cases such as e.g. 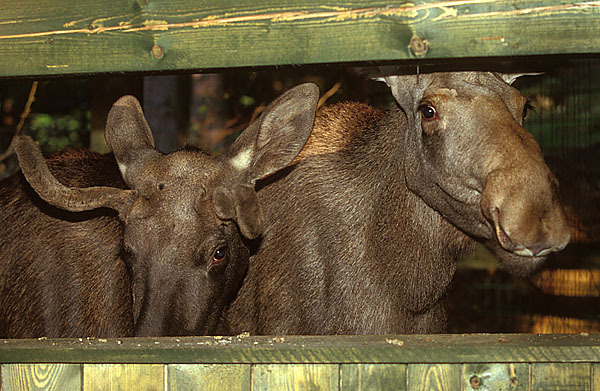 the Swedish "moosegarden" (check in the link page), moose have been used as pets before. Just imagine the moose then as a slightly oversized dog from behaviour point of view. Newborn calves must be tamed within 7 days after birth, within 14days it is still possible but harder, after 14days it seems impossible to ever get a really tame moose. 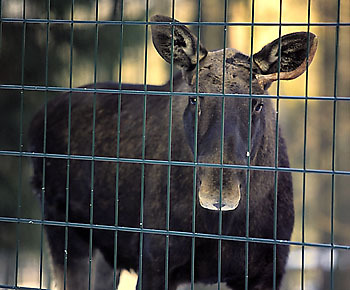 Grown moose cannot really be kept captive, they often die of heart failure if kept in captivity. Bottle-/handfed bulls don't see the human as rival, but as partner. Calves in freedom need the vicinity of their mother and cry for her, so the cow can protect them. In captivity the human must take the cows position, so the calves must be kept in the house to be close to their surrogate mother and become another member of the family. Calves are extremly curious - they want to learn by smelling, feeling, moving, trying, tasting. You can imagine this leads also to Chaos and destruction in your home, still they are very adaptive and can be educated. They have a built-in clock and are punctual for feeding, cows keep that punctuality later also for milking. The young moose have strong bands to their feeder, which they keep as grown-ups and amazingly also to their feeder's voice. As in nature the moose must leave the "mother" at a certain point in time - in this case also because of the fast growth (could be you can't get the moose out of the door any more at a certian point in time). As in freedom they don't like to be driven off at all and remain some days complaining and crying in front of the house-door. A hard time of weaning. Walter S.Griggs, a friend and moose soulmate (although we have never met personally yet), is teaching history and honors courses, business law and served a associate dean at the Virginia Commonwealth University (VCU) School of Business in Richmond, Virginia. Impressive enough. But his heart beats for our common friends - the moose. You find references to his books about moose in the moose books section. And he definitely has more moose trivia than me, better stories, closer distance to wild moose and an essential larger auditorium to bring moose and people closer together - his students. In Iroquois traditions, "the moose spreaded it's breath", when the wind blew from the East. The North American Abenaki explain the uneven moose proportions by a myth: Gluskabe - who shaped himself out of the dust the creator had brushed from his hands after creating the Earth - took care of the Humans and feared that animals might harm the people. The creator had made the original moose too large and dangerous. Gluskabe wanted to change this and decided to amke the moose more gentle and decrease it's size. In the process he pushed the moose unevenly to a smaller size - resulting in a very large nose - and a gentle character. "labrum ei superius praegrande; ob id retrograditur in pascendo, ne in priora tendens involvatur." "Its upper lip is so extremely large, for which reason it is obliged to go backwards when grazing; otherwise, by moving onwards, the lip would get doubled up"
"There is also the achlis, which is produced in the island of Scandinavia; it has never been seen in this city, although we have had descriptions of it from many persons; it is not unlike the elk, but has no joints in the hind leg. Hence, it never lies down, but reclines against a tree while it sleeps; it can only be taken by previously cutting into the tree, and thus laying a trap for it, as otherwise, it would escape through its swiftness." "There are also [animals] which are called elks. The shape of these, and the varied color of their skins, is much like roes, but in size they surpass them a little and are destitute of horns, and have legs without joints and ligatures; nor do they lie down for the purpose of rest, nor, if they have been thrown down by any accident, can they raise or lift themselves up. Trees serve as beds to them; they lean themselves against them, and thus reclining only slightly, they take their rest; when the huntsmen have discovered from the footsteps of these animals whither they are accustomed to betake themselves, they either undermine all the trees at the roots, or cut into them so far that the upper part of the trees may appear to be left standing. When they have leant upon them, according to their habit, they knock down by their weight the unsupported trees, and fall down themselves along with them." Some sources swear on soap to deter moose from destroying home gardens. A bear skin shall have the same effect. Due to the very high concentration of plant fiber in moose droppings, early settlers have used them as a fire starter. Not meant verbally here :-) Because of the high amount of plant fiber in moose droppings it is an excellent raw material for paper production. Moosegarden, a Swedish moose park (see link section), is producing such dropping paper for sale.
" ... when we suddenly spied two moose standing just on the edge of the open part of the meadow which we had passed, not more than six or seven rods distant, looking round the alders at us. They made me think of great frightened rabbits, with their long ears and half-inquisitive, half-frightened looks; the true denizens of the forest, (I saw at once,) filling a vacuum which now first I discovered had not been filled for me, - moose-men, wood-eaters, the word is said to mean ..."
"... nature looked sternly upon me on account of the murder of the moose ..."
"Every creature is better alive than dead, men and moose and pine-trees, and he who understands it aright will rather preserve life than destroy it." His last words are said to be: "Moose ... Indian"